Polonium atoms have 84 electrons and the shell structure is 2.8.18.32.18.6. The ground state electronic configuration of neutral polonium is [Xe].4f14.5d10.6s2.6p4 and the term symbol of polonium is 3P2. Polonium: description Your user agent does not support the HTML5 Audio element. 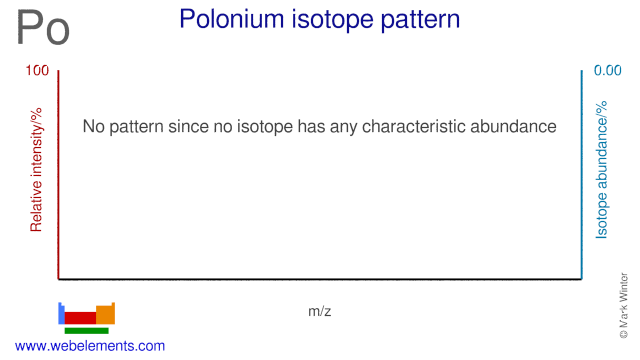 Polonium has more isotopes than any other element, all of which are radioactive. Polonium dissolves readily in dilute acids, but is only slightly soluble in alkalis. Weight for weight it is about 2.5 x 1011 times as toxic as hydrocyanic acid (HCN). Polonium has been found in tobacco as a contaminant and in uranium ores. 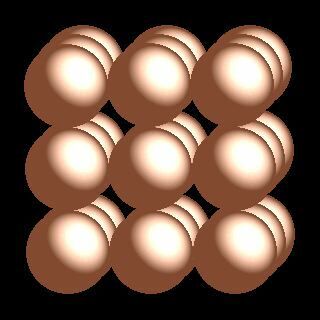 The solid state structure of polonium is: bcc (body-centred cubic). Reactions of polonium as the element with air, water, halogens, acids, and bases where known. Binary compounds with halogens (known as halides), oxygen (known as oxides), hydrogen (known as hydrides), and other compounds of polonium where known. Bond strengths; lattice energies of polonium halides, hydrides, oxides (where known); and reduction potentials where known. Polonium was discovered by Marie Curie in 1898 at France. Origin of name: named after "Poland" (birthplace of Marie Curie). 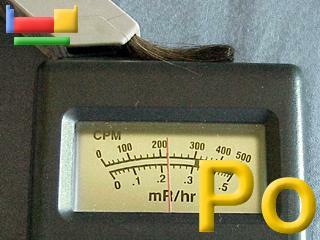 Isotope abundances of polonium with the most intense signal set to 100%. Isolation: polonium is radioactive and excessivley rare in nature. It is made in very small qunatities through a nuclear reaction of bismuth. Neutron irradiation of 209bismuth (atomic number 83) gives 210polonium (atomic number 84). Metallic polonium can be fractionally distilled from the bismuth or electrodeposited onto a metal surface such as silver.